Niall Breen did a magnificent job in flying the Irish flag in Romania this weekend, taking his second podium place in the Lloyds TSB Insurance British F3 International Series. 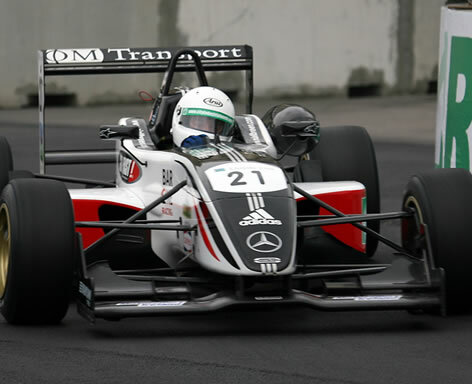 The Dundalk rookie, who turned 21 this month, elevated himself from seventh to fifth in the championship in only his third season of car racing with a fine fourth and second place in rounds five and six respectively at the Bucharest street circuit. It was the British Formula 3 series' first visit to the well-organised street race in Bucharest, all the drivers and teams having the same advantage. However, Breen in his Bar One Racing-sponsored Carlin Motorsport, run Dallara Mercedes had to play catch up in practice on Friday having been involved in an incident early on, which left him with only three laps under his belt. He lost little time in making up for his shortened practice time and during official qualifying for round five on Friday, he posted an amazing fifth fastest time behind Marko Asmer, Carlin team mate Antonio Valerio, Sebastian Hohenthal and Sam Bird, also from Carlin. As the first challenging street race got underway, Breen maintained his fifth place for the first couple of laps until Hohenthal crashed out bringing out the safety car for about three laps. At racing speeds again, Breen held station behind Carlin team mate Bird and as the chequered flag came out for Asmer, Breen finished close behind his Carlin team mates, Valerio and Bird to take fourth place. Qualifying for round six was also held on Saturday morning in extremely changeable weather conditions. It was wet for most of the session and Niall was third quickest until the final few minutes when the track dried and he was bumped down to seventh on the grid for the 24-lap race. On Sunday morning, the cars lined up for round six and Breen took Hohenthal for sixth on lap three just before team mate Valerio pushed out Stephen Jelley, elevating Niall to fourth place. Another incident between Maro Engel and Atte Mustonen eliminated both cars and Breen was then chasing leader Bird in second place, with Jelley pushing Niall hard in third. The slick-shod cars picked their way between the unforgiving walls of the streets and the intermittent rain showers kept the track fairly slippery. On the 14th lap several of the national runners came to grief and once again the safety car was deployed as the rain came down again. There were only two further laps run under the green flags and Breen opted for a safe second as he finished just 1.948s behind Bird with Jelley third. While fellow countryman Michael Devaney took fastest lap, Niall had the second fastest lap of the race. The series returns to the UK for the Snetterton, Norfolk double-header on June 3rd.